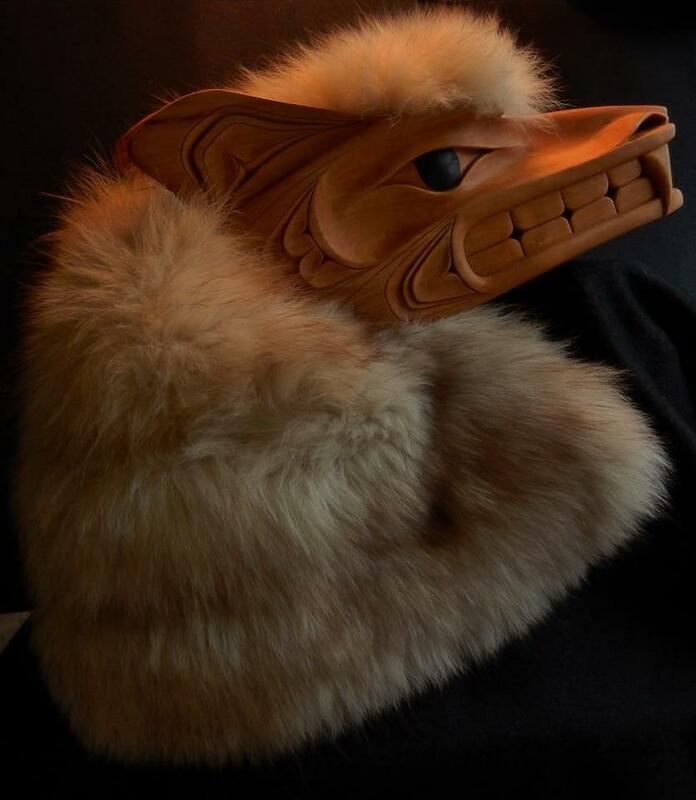 As an artist, Carol Young has gone from strength to strength, so when her “Wolf Mask” became available for sale, I jumped at the chance to buy. In the not-too-distance future, I may not be able to afford her work, and I wanted – at least – a second piece of work to enjoy in my townhouse. This premonition is based on how far and how fast Young has come as an artist. 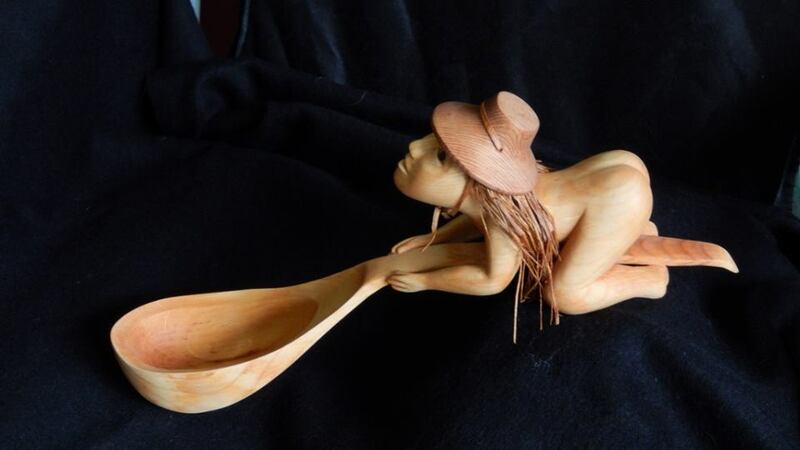 Less than five years ago, Carol Young began a new career as a carver. 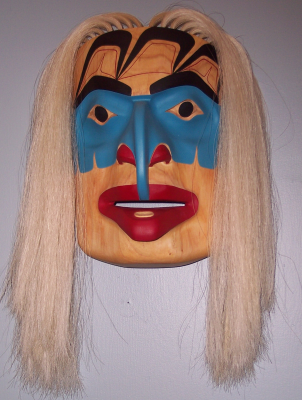 In her second year at the Freda Diesing School of Northwest Coast Art, she emerged as one of the most accomplished students in her graduate class, winning the encouragement of master carver Dempsey Bob and becoming the first recipient of the Mature Student Award. 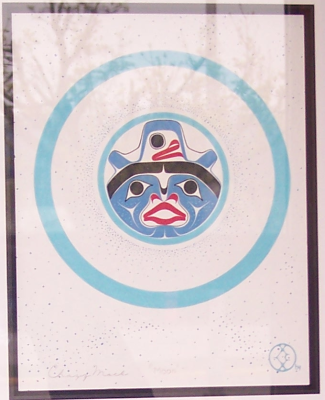 In the four years since then, she has gone on to develop a strong original style with a strong interest in the role of women and environmentalism in First Nations Culture. 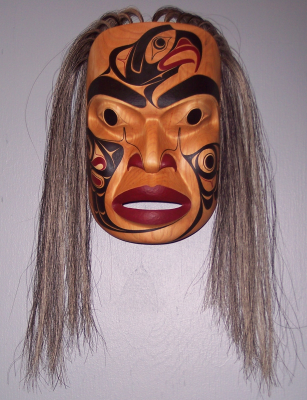 Recently, at sixty, she had her “Moon Matriarch” mask adapted for gold and silver Canadian coins. 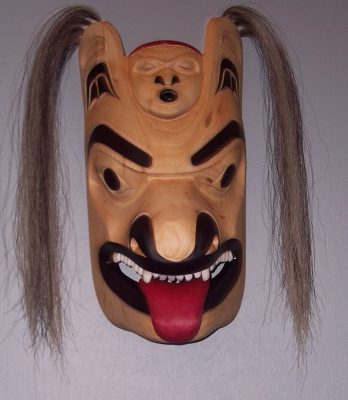 “Wolf Mask” reminds me of Bill Reid’s comment that traditionally the wolf must have been a mythical creature to the Haida, because there are no wolves on Haida Gwaii. 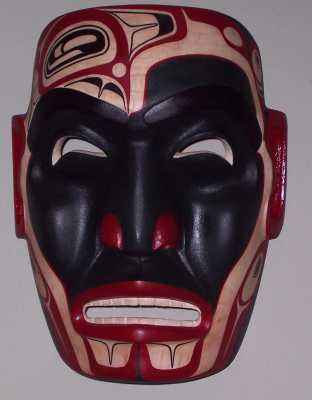 Like Reid’s own wolves, Young’s mask depicts a degree of ferocity missing from the depictions of other animals. It is a fantasy creature, with an exaggeratedly large mouth and teeth, with fangs that cannot be contained its jaws, and large, swept-back ears that suggest an aggressive alertness. The impression is rounded off – literally – by the U-shapes at the edge of the jaws and the eye sockets that creates a clenched look, as if the grimace on the mask is habitual. This sense of ferocity is all the stronger because Young has left the mask mostly unpainted. 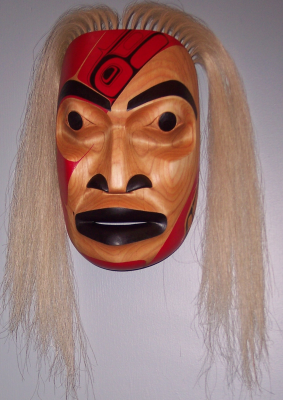 The lack of paint makes the carving more pronounced. And when Young does add black to the wolf’s outsized pupils, they appear larger and wilder than they possibly could have if surrounded by any other paint – even another section of black. 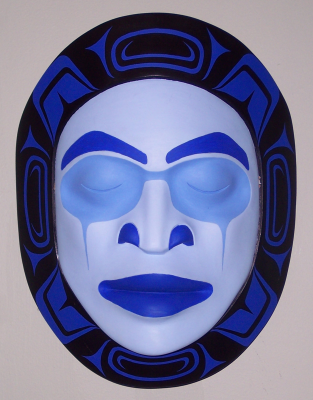 More often than not, fur added to a NorthWest Coast mask is a step too far – a sign, usually, that the artist is uncertain about their skill and trying to hide any errors by over-embellishing. However, the fox fur that Young adds is an exception. 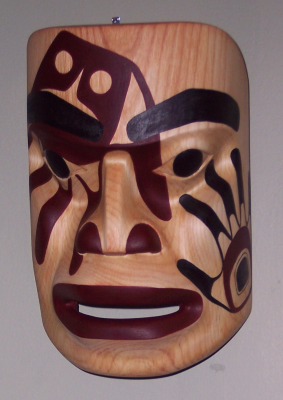 Its untidy shagginess on the top of the mask adds to the ferocity, while its off-white color contrasts strongly with the natural color of the wood. 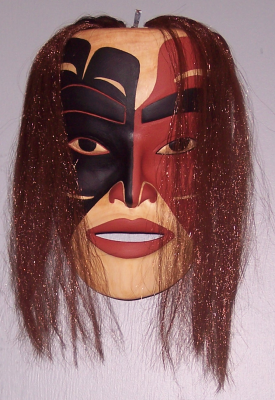 Unfortunately, the fur made shipping the mask to the United States impossible. But since that technicality is why I was able to buy it, I have no complaints. 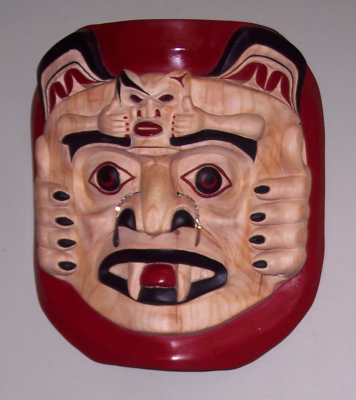 However I got my hands on Young’s “Wolf Mask,” I consider it one of the outstanding treasures in my art collection. On April 23, I did something I had been waiting to do for ten months: I stood up at the graduation ceremony for the Freda Diesing School of Northwest Coast Art at Northwest Community College in Terrace, and gave out the first Mature Student Award. Trish and I hope it will be the first of many, and I think the award got off to a good start by having Carol Young (Bagshaw) as the first recipient. 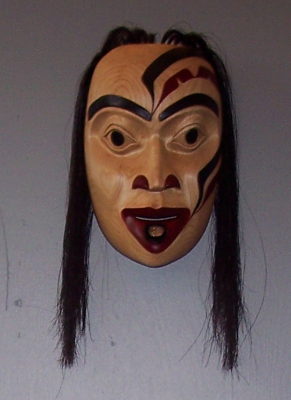 A member of the Haida Eagle side, Young did not grow up with traditional culture, but absorbed much of it indirectly from her mother. Later, as a single mother of four, she began selling a variety of handicrafts and art pieces loosely based on Northwest Coast design on eBay. Although she says she never thought of herself as an artist, she sold over a hundred pieces of every description imaginable. 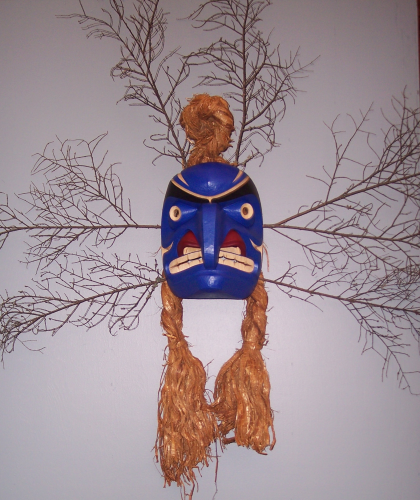 Masks, rattles, miniature canoes, and, most of all, Haida-inspired dolls – all of these and more she managed to produce as a way of bringing in extra money. With her children grown, Young decided to do something for herself, and enrolled in the Freda Diesing School last September. Her teachers and fellow students tell me that at first she seemed to have trouble feeling comfortable in the dorms or the class room, and that learning formline design didn’t come easily to her after years of doing things her way. However, in the second semester, especially after hearing that she had won the Mature Student Award, Young started to hit her stride. Her design took on a new discipline and maturity as she absorbed what the teachers had been telling her, and she found a place among the other students, most of whom were far younger – although at times, she told me with a smile, she felt that her role was that of den-mother in the dorms. By the end of the school year, Young had become the speaker for the first year students, announcing them at the graduation ceremony, and appearing with fellow student Sheldon Dennis on a CBC podcast about the school. She also took it on herself to present me with a school cap and T-shirt, and, when I requested one for Trish (who was unable to attend the graduation), gave me hers, claiming that she didn’t wear T-shirts anyway – a kindness that I was grateful for, although I wondered if it was true. During the podcast, Young said that attending the school had given her “a whole new life.” Previously, I had only contacted her briefly via email, but when I met her during the graduation ceremony and exhibition, she seemed like a person who was happy about the direction she was heading. 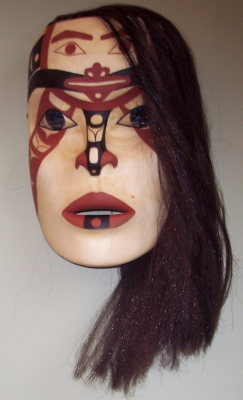 Not only was she in the middle of preparations and cleanup for the weekend, but she talked about how she hoped she could present a female perspective in her carving, which she felt – despite the name of the school – had been under-represented or explored. She said, too, that she would like to establish an award for women at the school, and would like to teach after she graduated next year. My impression is that Young is the sort of self-starter who can get where she wants to be under her own power and on her own terms. But I would like to think that the Mature Student Award made her self-development a little easier and quicker than it might otherwise have been. As the first recipient of the award, she sets a high standard. If next year’s winner is even half as deserving, I will feel that our ongoing involvement in the school through the award has been worthwhile.